Many consumers know about Sony's recall of laptop batteries that it manufactured for its computers, as well as those for Apple and Dell. But the Japanese electronics giant has also posted another CCD Service Advisory. According to Imaging Resource, the problem is caused by "internal wiring in the CCD sensor comes loose at high temperatures and humidities, and causes the camera to stop recording images, or to record distorted images. During the last round of service advisories we heard that the problem may have related to moisture penetrating into epoxy chip packaging. Interestingly, the Japanese PC Watch website states in its coverage of the news that this time around, the affected sensors use ceramic packaging, which generally offers better environmental sealing. According to PC Watch, moisture can potentially penetrate the ceramic packaging nonetheless, entering via the gluing surface." Affected cameras recently added to the list include: Cyber-shot DSC-F88, DSC-M1, DSC-T1, DSC-T1, DSC-T3, DSC-T33, DSC-U40, and DSC-U50. We're still waiting for news from Sony USA for next steps. Canon had dropped the price on the Rebel XT by $100 US, now offering the kit with the 18-55mm lens for $699 -- $100 more than Nikon's just announced D40. 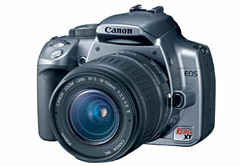 Unlike the D40, you can buy just the Rebel XT body without kit lens and save another $100. The Canon XT has an 8-megapixel sensor compared to the 6-megapixel Nikon D40. But the D40 has a 2.5" LCD compared to the 1.8" version in the Rebel XT. No matter how you slice it, this price reduction for the XT and the emergence of the D40 are good news for consumers. 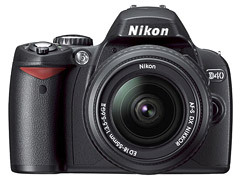 Nikon D40 - DSLR for the Masses? The just announced Nkon D40 ships in December and is priced at $599 US with an 18-55mm f/3.5-5.6 kit lens. This is the most affordable top-brand DSLR kit on the market, and it's well within the reach of most enthusiasts. "On the plus side you get ISO 3200 equiv. (HI 1), the ever useful customizable Auto ISO, a larger viewfinder view, shorter shutter lag and viewfinder blackout, a larger LCD monitor, a considerably nicer user interface, SDHC support, a new image processing engine, unlimited JPEG continuous shooting, in-camera retouching (including D-Lighting) and of course a smaller and lighter body." Could this be the DSLR that every serious amateur owns? We'll find out in December. I recently sat down with Joe Schorr, Aperture Product Manager for Apple, and talked about the inception and evolution of Apple's pro level photo management application. Joe has been a part of the project from the very early days, and he's helped Aperture reach its one-year birthday in good shape. I recorded these podcasts in Joe's office on the Apple campus in Cupertino. It's rare that an Apple employee gets to talk freely in front of a microphone, and I think Aperture fans will enjoy these candid convesations. 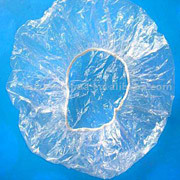 In just about every hotel bathroom, you'll find one of the handiest photo accessories for inclement weather -- the shower cap. And more often than not, you leave that shower cap behind upon checkout. Next time grab it. Simply punch a hole in the center of the cap for your camera lens to extend through, and you have an all weather protection system for your compact or small DSLR. The elastic band of the cap keeps it positioned snugly around your wrists while the cap protects the camera from all sides. You can work the controls, view the LCD monitor, and take pictures in the rain just as easily as on a sunny day. This opens new opportunities for your photography. Rainy conditions often make dramatic shots with saturated colors. So grab a shower cap and hit the (wet) streets. I've been working on a new site that was recently launched at PhotoPlus Expo. Inside Aperture is a gathering place for photographers who want to learn Apple's photo management application inside and out. The basic features of this destination include the blog that highlights a new daily post from one of six experts, plus me :) For example, I recently explained how to Create Your Own White Balance Presets. This tip enables you to create a list of presets that you can cycle through when determining the right white balance setting for your Raw files, just like you can in Adobe Camera Raw. We have stuff like this go up every day. I'm also interviewing people who are directly involved with Aperture, such as Joe Schorr (product manager) and posting those discussions as podcasts on the site. Plus, there are articles and other chunks of useful information to help you master one of the best photo management tools to ever come down the pike. I might also add, we're looking to add more contributors to the site. So if you have a few Aperture tricks up your sleeve that you'd like to share with others, be sure to drop me a line. 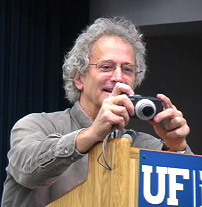 "We had a great guest speaker, photojournalist David Burnett, at UF Monday night. He gave a guest lecture in conjunction with the opening of a show that has been making the rounds at university galleries. I filmed him as part of my job (Web Administrator at the journalism college here), and the video is available as a QuickTime streamed webcast on the University site." David's commentary includes discussion and images of U.S. presidents and presidential campaigns, sports including the Olympics and baseball, and the aftermath of Hurricane Katrina. It's really worth a look. Thanks Craig for the heads up! Last month, I reported on the Panasonic Lumix DMC-LX2. Photography Blog had given the camera a decent review, but indicated that Panasonic hadn't really made much progress controlling image noise. But two more noteworthy reviews have been published since my October 11 posting. If you're interested in this camera, you might want to keep reading. "A pocketable alternative to a digital SLR, the 10.2MP LX2 packs a gorgeous 2.8-inch LCD screen with a full 16:9 aspect ratio, loads of controls, improved burst rate, true high-definition video recording, a new image processor, and 16MB of built-in memory. It's even available in black in addition to silver. Best of all: its performance on our Certified Lab Tests -- and its "steal-me" price." Then, I just read another review on Imaging Resource that also gave the Panasonic very high marks, saying, "While the Lumix LX2 could certainly be enjoyed by beginning users, since it has great automatic functionality, it's the photo enthusiasts who will get the most out of this sophisticated and snazzy little model." Bottom line for me: I'd really like to shoot with this camera, especially in Raw mode, and see for myself. But on paper, I trust these reviewers and am now recommending the camera for advanced amateurs who want a pocketable Raw shooter.